I originally wrote this in 2004 but only recently realized it wasn't available anywhere onlne. I shared this document with the community of currency practitioners that attended the June 2004 Local Currencies Conference at Bard College organized by the E.F. Schumacher Society. It was well received, but there was not enough unity or energy to follow up, so nothing came of it. 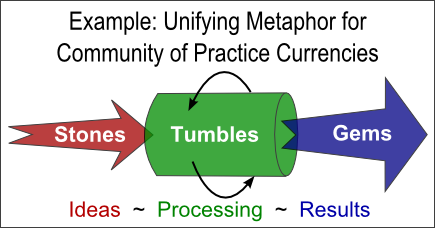 But it was the original design of the application of Stones/Tumbles/Gems for a Community of Practice. It's a little funny to read this now. My initial exposure to the complementary currency community was very commercial: people patenting their designs, algorithms and processes and wanting to charge others for doing things like accounting in two currencies. It looked to me like this industrial age strategy of competing with each other and marking off intellectual property would seriously cripple any ability for a movement to grow. Luckily, it turned out that more people in this space were closer to social activists, than corporate patent lawyers, so collaboration did occur. I also proposed using these in a very non-commercial context in the Omidayar Network online community. Information GAINS value when shared. We all benefit from creating an environment which fosters the free flow of information among its members. There is a noteworthy gap between an idea and its successful implementation. Both elements, root ideas and the tools & strategies for successful implementation, should be rewarded. Improving currencies means more successful implementations which brings us toward our goal of creating a rich ecology of diverse currencies functioning in parallel. The idea that a single individual “owns” an idea which emerges from group discussion because they filed legal claim on it, is outdated and needs to be adjusted to reflect wider contribution and participation. We can build a system which rewards people for their various contributions by leveraging the very types of currencies that we are building. Members should be unhindered in pursuing proprietary/commercial applications of their intellectual property off-system. In other words, just because somebody allows members of the commons to use an idea and be rewarded in complementary currencies, does not mean that they can’t charge license fees or royalties to organizations or projects outside the commons. We are proposing the deployment of an online community of practice sponsored and managed as a non-profit mutual benefit corporation or cooperative. This non-profit holds in trust the intellectual property licensed to it by its users for their mutual, collective and individual benefit. User Profiles: Each member can include information about their experience, background, interests, specialties, projects, affiliations, contact information, etc. Profiles will also display the cumulative earnings of each currency (Stones, Tumbles, Gems & Treasure). Each user will have their own ID & password which will ensure all their contributions are associated with their account and allow them to edit their posts and projects. The user profiles should also be compatible with the Identity Commons standard for interoperability with other web sites and electronic currencies. User Directory: Members can search the directory to connect with other members for projects and advice. For example, people working on core ideas can look for people with high Stone scores; others seeking help with implementation can seek those with high Gem scores. Personal Message Boxes: Members can correspond with other members and user-defined groups through their personal message box for topics that may not be ready for the group discussions. Active correspondence of this type counts toward participation points (Tumbles). Dialog Zone / Group Discussions: This is the main arena for the idea sharing and development process. Members can create new discussion areas for special topics or types of projects and participate in the discussions that other members have created. In a manner similar to Slashdot, members can rate the quality of postings so that valuable information rises to the top and “noise” gets filtered out. Members receive participation points (Tumbles) for postings unless they are noise and can earn idea points (Stones) for high-rated postings. Knowledge Bank (IP-Base): The intellectual assets of the commons are published here when approved by a peer-review/juried committee. Ideas that emerge from discussions are edited, compiled and posted here as Knowledge Elements attributing the ownership of each element to its editor and creators who earn idea points (Stones) for sharing it. Pre-existing, public-domain and externally-owned intellectual property can also be published here to make it centrally available to members of the commons. Project Postings & Performance: Specific currency designs and projects are posted to this section of the site along with information about their targeted communities and behavior. The ideas incorporated in the design are cited which cause rewards in idea points (Stones), and the designers and implementers earn credits in result points (Gems) for their project. Monthly performance statistics for the project will be posted to gauge the effectiveness of the design and its deployment. The designers earn result points for ongoing success of their designs. Standings & Scoreboards: In order to see who is contributing in what ways and to acknowledge people for their participation, there will be a number of standing lists or scoreboards which will show things like contribution of ideas, participation and results (Stones, Tumbles & Gems) for the month, quarter, year, life of the site, etc. This becomes a great way to find people who may have the kind of expertise needed for projects being built by new members. There are multiple currencies which are designed to measure and reward specific types of participation and contribution of members of the Currency Commons. Stones / Creative Input of Ideas – Stones reward the ideas which are the rough materials from which actual currencies are designed and deployed. You earn stones for posting valuable ideas in discussions, building parts of the knowledge bank, and for each currency your ideas are used in which gets added to the project postings and credits your ideas. Essentially, stones are earned for quality of contribution as demonstrated by peer feedback, ideas incorporated into the knowledge back and into actual projects. Ideas which don’t get used much don’t earn many stones. Tumbles / Active Participation – Tumbles are earned through almost any form of constructive participation, such as speaking in discussions, serving on committees, posting your projects and ideas, corresponding with people through your commons message system. Tumbles are intended to reward and encourage all forms of active, constructive participation. The only kinds of participation that are not rewarded with Tumbles are passive lurking and postings which receive negative feedback. A specific threshold of Tumbles are required to convert your Stones and Gems to Treasure each month until you are “tenured” by reaching a threshold of Treasure. Gems / Translating Theory to Practice – Gems reward the translation of ideas into successful projects. Each project posted outlines its design and targets (such as number of participants, levels of activity, etc.) as well as citing the ideas implemented in its design. Each month, the currencies report the actual performance metrics of their currencies. Gems are initially for designing and posting projects and can continue to accrue each month based on the success of the system. Treasure / Stored Value from Contributions – Each month, every member who qualifies through being tenured or exceeding the Tumbles threshold gets their current balance of Stones & Gems converted to Treasure. (Gems expire each month if not converted, Stones expire after 6 months if not converted) Treasure represents your “shares” in the mutual benefit corporation and determines what (if any) distributions you would receive from revenue that the commons earns from licensing the “internally developed” intellectual property. Members could store up their Treasure increasing their “shares” in the commons or “cash out” portions as necessary, by converting to Currents (see flow diagram in separate attachment) which would in turn be converted to various local currencies by the sponsoring organizations. All participants are individuals. The commons does not provide accounts for corporations, businesses or organizations. The license is a “mutual use license” which basically allows all members of the site while in good standing to use each other’s ideas as long as the usage is properly “credited” to its source. Items posted to discussion groups, knowledge bank, and project postings will be have a time/date stamp to establish dates of “prior art” for any later IP inquiries. Dated responses and ratings to these postings will provide correlative data in “witness” to the initial posting. Users agree to testify on behalf of the commons to protect the IP-Base and/or establish date and veracity of IP which they published or responded to. Any patent derived from internally developed IP will be licensed royalty-free back to the commons. Independently developed patents licensed to the commons must do so in accord with standards commons licensing. Outside publication of any ideas from the commons knowledge bank must site the commons as the source. - Patent-holders waive any and all rights to claim infringement or pursue damages from projects using their IP which are posted to the site and appropriately crediting their IP in the project posting. The credits received through the commons system will substitute for any monetary royalties that the patent-holder can pursue. Note: Since organizations cannot directly be members of the network, businesses and governments wishing to use the intellectual property are responsible for making arrangements directly with the owners of the external IP. If this community succeeds functioning in a productive manner, then it seems certain that new IP will be developed in dialogue on the site. The commons ideally should become a breeding ground for new ideas in the currency domain. Taking an “Information Age” perspective on the matter, it doesn’t seem appropriate for individuals to race to patent these ideas for their own personal benefit and own them for the next 20 years. So, it seems that there is no way to avoid having certain IP held by the commons itself. Some ideas for community applications may be worth publishing widely into the public domain to make it difficult for anyone else to patent. However, recent behavior in the Patent Office (such as issuance of a patent to Microsoft for a breed of apple submitted by a nearby farmer) seems to indicate that you can’t rely on thorough due diligence in the patent process. There may be ideas with commercial application worth patenting by the commons because it may be cheaper to patent than to fight somebody else’s patent in court after it’s been issued. This IP can be used by all the membership in good standing, but has the potential of being licensed for commercial applications generating revenue for the commons. I hope each of you will take time understand the larger picture in this proposal and let the ideas marinate for a bit. It is certainly a bit different than the other commons models that I’ve seen, but I think it is movement in the correct direction. This document was only meant to be an overview. There are certainly numerous details (such as the management structure, committees, committee selection, review processes, appeals, formulas for converting Stones & Gems to Treasure, existence and amount of membership fees, etc.) that would need to be hammered out for this to work. It is my hope that we can be working from a shared understanding of our goals and a framework (such as proposed herein) to fulfill on those goals before we get mired in the details. P.S. Brian Allen, participating in local currencies in Seattle, owns the domain names CurrencyCommons.org and .com for some similar purpose as this. I’m copying him on this message so I can find out whether or not this approach resonates with his intention for the use of these domains. At the moment this seems to me like the most desirable name for this community following the lead of the Creative Commons and Chaordic Commons.